The CLAS Latin American Garden is a living laboratory featuring many of Latin America’s most culturally significant plant species. Reflecting CLAS’s particular strengths in Mexico, Central America, Brazil, the Andes, and the Black Atlantic regions, the garden serves as a unique teaching tool that brings students, faculty, staff and the Nashville community together to explore the relationships between people and the plants of Latin America. It provides a starting point for discussions of Latin American cultures, history, global expansion, politics, economics, diet, health, biochemistry, and pharmacology. The garden is a microcosm of these issues and a way of grounding coursework and discussions on a variety of topics in the Arts & Sciences, as well as in Nursing, Medicine, Peabody College, and K-16 outreach. 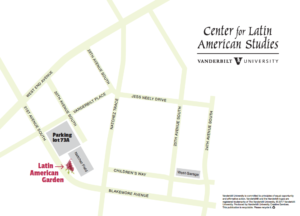 The Latin American Garden was designed in coordination with Vanderbilt’s Landscape Architect Robert Waits, horticulturalist Laura Barker, and Grounds Manager Danny McKissack. The majority of the plants in the Latin American Garden were generously donated by the Latin American and Caribbean Studies Institute at the University of Georgia from their ethnobotanical garden that was established by anthropologists Brent and Elois Ann Berlin nearly 20 years ago. 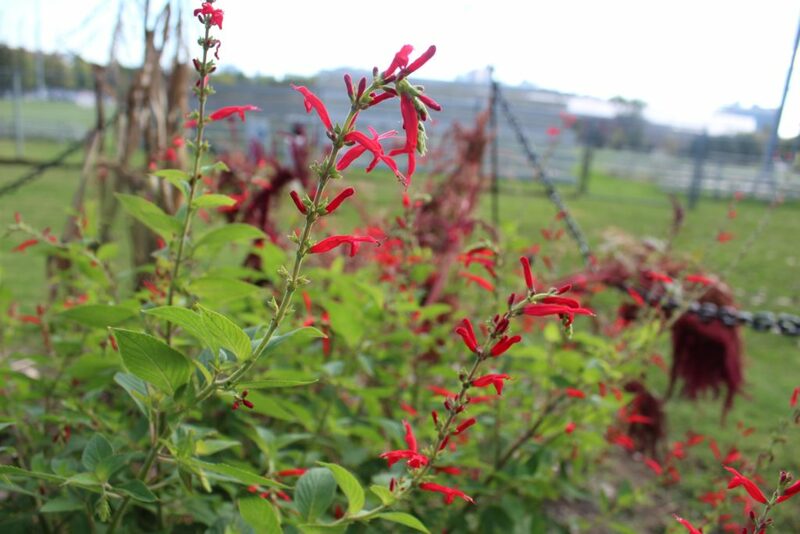 Matthew Blair at Tennessee State University donated the amaranth, and funding from the U.S. Department of Education, as well as gifts to CLAS, supported the purchase of annual plants, as well as supplies for maintaining the garden. The Latin American Garden is located between Natchez Field and 31st Avenue North, adjacent to Lot 73A, and is visible from Blakemore Avenue. To open a large version of the map below, click on the image. The Latin American Garden is a wonderful place for K-16 classes to learn about the natural environment. If you are interested in bringing your students to the garden for a 45-minute visit, please email CLAS Outreach Coordinator Colleen McCoy (colleen.e.mccoy@vanderbilt.edu) to express your interest. We recommend visiting the garden in August, September, or October. 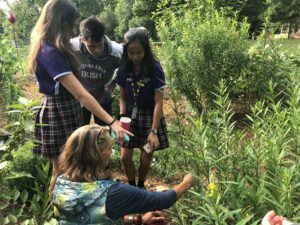 Description: Educators joined Vanderbilt and TSU as we visited and explored the new Latin American Garden at Vanderbilt University. With a special focus on Aztec flora, this workshop introduced the deep cultural and historical significance of the garden’s plants. Experts discussed the wide uses of the plants, including practices related to medicine, art, religion, dyeing, and nutrition, as well provided information on plant breeding and genetics. The workshop concluded with time to develop curriculum with Vanderbilt’s Jonathan Ertelt and share ideas with fellow educators. Related resources from this workshop are available in the CLAS Curriculum Resources. View photos. For inquiries regarding the garden, contact CLAS Executive Director Avery Dickins de Girón (avery.dickins-degiron@vanderbilt.edu).